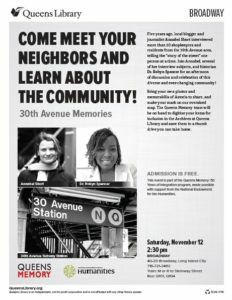 I’m thrilled that on Saturday November 12 at 2.30 pm Queens Library will be hosting a celebration of 30th Avenue and the surrounding neighborhood. The event marks five years on from my project interviewing people who live and work along 30th Avenue. Come and join us! And please bring photos and memorabilia of Astoria to share. Queens Memory Project will be there to digitize and record your memories of the neighborhood. Where: Queens Library (Broadway branch), 40-20 Broadway (between 40th and 41st Streets). When: 2.30pm, Saturday November 12.